When it comes to upgrading your bed, the first thing that will probably come to your mind is getting a new mattress or a new sheet set. Pillows, however, play a significant role in getting enough of a quality night’s sleep and they can mean the difference between waking up stiff and in pain and waking up feeling refreshed and totally ready for the new day. 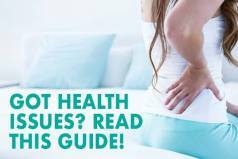 There are plenty of pillows to choose from, but these days many people opt for memory foam pillows as they provide a better contour to your head and neck than other types of pillows and keep them in a proper alignment with the rest of your body. 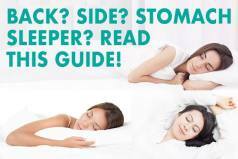 They are known for their pressure relieving properties, classic memory foam hug and extraordinary comfort, but how to pick the right one for your specific needs and sleep preferences? 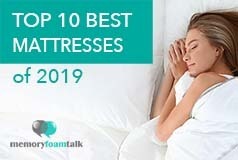 In this review, we’ll take a look at one of the best memory foam pillows you can find on today’s market designed to suit a wide range of sleepers with different sleep preferences. It was created by Tomorrow Sleep leveraging the knowledge, research and engineering expertise of Serta Simons Bedding, one of the largest manufacturers and distributors of sleep products in the United States. Available in cool-coated premium Memory Foam with two-sided construction and in Plush with fluffy hypoallergenic Memorelle fill and a silky sateen feel, Tomorrow Sleep pillows are produced of the highest-quality materials and designed to help the users achieve a sound and restorative sleep. The Tomorrow Sleep Memory Foam pillow is shipped compressed in a 16″ x 6.5″ x 6.5″ box. There is a slight off-gassing coming from the pillow upon opening the box which quite normal given its all foam construction, but it is nothing overpowering and dissipates within a few hours. The pillow itself is 16“ wide, 28“ long and 5“ high and made of three layers of the highest quality Polyurethane Foam. The Polyurethane Foam used in the construction of this pillow is CertuPUR certified which means that is made entirely of safe and non-toxic materials without the use of ozone depleters, PBDEs, TDCPP or TCEP (“Tris”) flame retardants, and formaldehyde. This also means that the pillow does not include mercury, lead and other heavy metals, phthalates regulated by the Consumer Product Safety Commission and Low VOC (Volatile Organic Compound) emissions for indoor air quality (less than 0.5 parts per million). The pillow is one flat block of dense yet soft foam specially designed to suit a wide range of sleepers and provide them with a personalized support by conforming to the unique shape of their heads and necks. Although we generally prefer pillows made of shredded memory foam that allow a good degree of customization so we can adjust them to our sleep preferences, we felt this one to be extremely comfortable. The pillow has small holes all over it which allow greater airflow and work together with a breathable cover to provide a cool and comfortable night’s sleep. The cover of the Tomorrow Sleep Memory Foam pillow is made of 54% Polyester, 29% Nylon, and 17% Polyethylene Knit 2″ gusset material and has a very soft, cool and pleasant feel to it. It is well made and can be used almost as a stand-alone pillowcase if you don’t want to use the separate pillowcase. The Tomorrow Sleep Memory Foam pillow is by far the most comfortable and supportive memory foam pillow made entirely of one flat block of memory foam that we have ever slept on. It is designed with a two-sided construction that feels cool on one side and cozy on the other, and it is a kind of a pillow that you can really hug and sink your face into. It has a low profile that helps keep your spine aligned while perfectly conforming to your head and neck for maximum comfort. It provides excellent support and is suitable for all sleeping styles, especially back and side sleeping, but it can also be a good pick for stomach sleepers who prefer low, form-fitting pillows. Its ultra-high density foam construction reduces neck straining and relieves pressure points around your head and neck thus allowing a more comfortable and painless sleep while the Aerated & Phase changing layer on the top helps you stay cool throughout the entire night and eliminates the need for flipping over your pillow again and again in an attempt to keep it cold. Besides this, the ultra-dense memory foam construction of this pillow does an excellent job in isolating movement and allows you to move freely and change your sleep positions easier. It is also extremely durable and will maintain its properties and provide you with a consistent shape and feel every time you lay your head down. This pillow comes in at $99 which is a bit pricey, but it is a reasonable price given the quality materials used in its construction and the overall comfort it provides. All Tomorrow Sleep products come with a 100-Nights Risk-Free Trial period, and this Memory Foam pillow is not an exception either. You can try it out, and if it is not your fit, you can return it for free within 100 days. It is also shipped for free and comes with a 5-year limited warranty. Click here to buy the Tomorrow Sleep Memory Foam pillow at the best price. Click here to read our full Tomorrow Sleep hybrid mattress review. Is the Tomorrow Sleep Memory Foam Pillow Right for You? Low profile pillows – The Tomorrow Sleep Memory Foam pillow has a low profile that conforms to your head and neck and helps keep your cervical spine in proper alignment with the rest of your body. It provides excellent support for all sleeping styles, and it can be a particularly good match for stomach sleepers who prefer low, form-fitting pillows. Cool-sleeping pillows – The Duocore construction of this pillow and the use of the Aerated & Phase changing layer on top of it makes this pillow breathable and along with its special cover prevents the buildup of heat, helps you stay cool throughout the entire night and eliminates the feeling of stickiness typical for most memory foam pillows. Memory foam feel – Being constructed entirely of memory foam, this pillow provides excellent pressure relief and the hugging feel, and it perfectly contours to your head and neck without causing you to feel trapped in foam. Although we prefer adjustable shredded memory foam pillows over those made entirely of one flat block of memory foam or latex, we are truly satisfied with how well this pillow worked for us. We are primarily side sleepers, and it provided our heads and necks with excellent support while in this position and kept them in alignment with the rest of our bodies regardless of its low profile. We did not feel the need to put our arms beneath it for additional height and support, and it did a great job at keeping us cool throughout the entire night which is something we especially like about it. So, if you like conforming, low profile pillows that sleep extraordinarily cool, this Tomorrow Sleep Memory Foam pillow may be the right choice for you. It will provide you with the right balance of comfort and support and keep you cool throughout the entire night which makes it worth its price and definitely worth looking at.